There is nothing fused or confusing on the menu at Catalina Room. The all-American menu speaks to everyman: there’s a cheeseburger, a club sandwich, a Caesar salad, a roasted chicken, a filet mignon, a slab of ribeye. 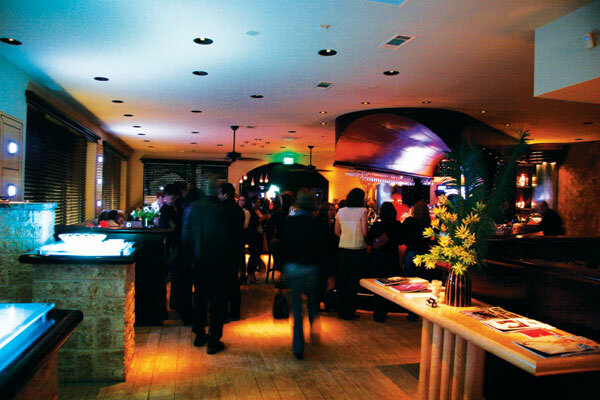 The bar is U-shaped, and the interior is warm—albeit eclectic—and friendly. These are classic American dishes made from scratch with quality ingredients, with prices that are equally egalitarian. What, no spinach-artichoke dip? Whoops, for a second I thought I was describing Houston’s, the runaway hit restaurant run by Hillstone Restaurant Group with the concept that everybody wants to copy. “Yes, I modeled the menu and the environment somewhat along the same lines as Houston’s,” says owner L.R. Deere, a 48-year-old who made his money, up to now, by selling catfish. Lots of it: he opened his first Top Cat spot on Lemmon Avenue in 1985, and today he operates six locations in the Dallas area. The Catalina Room is his way of noodling back into the potentially dangerous waters of the upscale dining business. Before Top Cat, Deere spent 20 years as a waiter and captain in some of Dallas’ finest eating establishments. He was on the opening staff of Antares at the Hyatt Regency before moving to the Anatole, where he was a captain at Le Entrecote and Mistral. In 2004, he acquired the worn-out The Wok on Lemmon Avenue and began construction. The pay-while-you-go project took more than two years and nearly $2 million to build. There were never any blueprints, electrical plans, or high-priced designers, just “a good group of contractors” who followed Deere’s daily direction. Perhaps that explains why the interior feels a bit disjointed: here Vegas schlock meets high-tech ’50s Palm Springs. The impressive exterior stonework is predominately Mexican driftwood stone that resembles petrified wood, and the interior is a combination of Mexican driftwood, shell stone, and Oklahoma ledge stone. There is a huge Phantom of the Opera-scale wrought-iron chandelier that hangs about two feet above a large round table in the center of the dimly lit main dining room. The bar is Honduran mahogany, and the surrounding banquettes are lined in a khaki-gold silk. The dining room booths are lined in mohair animal print. The Catalina Room is more American than Houston’s. Deere has mounted a flat-screen TV on the wall of various booths. The concept reminds me of the individual jukeboxes that once allowed you to control your own music while you dined. At Catalina Room, you can watch Sam Waterston’s eyebrows twitch up and down while reading the captioned dialogue of Law & Order. Or, if you must hear Waterston’s pleas, request the remote and turn up the volume. Getting something for free is another American ideal that Deere believes in. When you walk in the door, you are handed a complimentary glass of quite quaffable Domaine Ste. Vincent pink sparkling wine from New Mexico. The staff, trained by Dallas veteran frontman Wayne Broadwell, is courteous, informative, and knowledgeable. Since opening in late October, the Catalina Room has changed its executive chef at least three times. At press time, Jared R. Coffey, who recently graduated from Delmar College in Corpus Christi with a degree in culinary arts, was handling the duties. So it’s not surprising that the musical-chair chef game has not affected the quality of the food. And, although the interior is disorienting when the onion rings arrive, things get clearer: these are some of the best onion rings in town. Not those dang little strings that you don’t know how to eat, because neither fingers nor forks can handle the job. Not those pillowy Michelin-man rings coated in tempura. 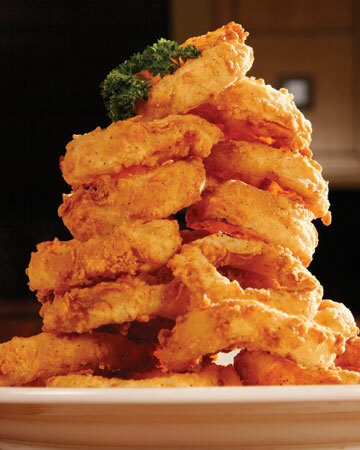 These are bracelet-size rings of tender-cooked sweet onion, with a delicate fried coating as sheer as a negligee. The chicken roasted in the wood oven was equally sensuous, with a garlic-scented juice oozing through the crunchy skin at the gentle nudge of a fork. Steaks—filet ($22), ribeye ($19), t-bone ($28)—are fine, especially for the price. The chicken-fried steak is a knockout. A pounded ribeye is lightly coated in seasoned flour and pan-fried, the accompanying mashed potatoes fluffy and buttery. Whole catfish is a fried glory: fillets half-separated from the backbone and splayed out like wings, presented head and tail on and served with excellent powdery potato fries. The only dish we tried that fell short was the lamb chops. Although there were five of them to the rack and only $19, they were heavily coated with too many mustardy crumbs. To his credit, Deere’s opening prices are lower because he wants to be fair to new customers who might experience a glitch in food or service. He wants to win loyalty with good value and hospitality, traditions that used to be the standard in America. But we won’t go there. Get contact information for Catalina Room.